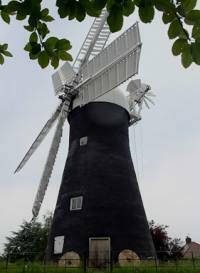 Holgate Windmill’s builder and first miller was George Waud. He was born in Barlow near Selby in 1717 and bought the land here on 27th December 1768. By October 1770 the Mill was working and George was living in the Mill house with his family. The Mill was built in open countryside looking over the hamlet of Holgate which was centred around the junction of Acomb Road and Poppleton Road near to ‘The Fox Inn’. These roads provided a direct route for the grain from local farms to the Mill and much of the high quality flour that George produced would have been taken into York. The original horse and cart track to the Mill survives, in narrowed form, as a snicket from Acomb Road. 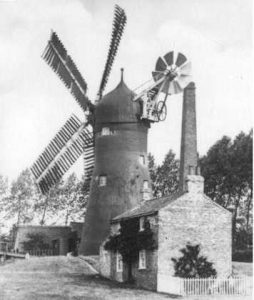 There had been a windmill at Acomb, in the area that is now called Millfield and another in the vicinity of the modern street Wilton Rise but both had gone by the time Holgate was built. Even so the City was surrounded by mills. George and then his son and grandson ran the Mill until 1851. It was then sold to John Musham, a local gentleman and run by a tenant miller John Thackwray from Boston Spa. In 1855 John Musham sold the Mill to Joseph Peart. Joseph Peart owned several mills in the area, developed property in St. Paul’s Square and lived in Mount Terrace House. He refurbished the Mill, probably installing the steam engine, and around 1858/9 was responsible for raising the Mill to the height that we see today. He employed William Bean Horseman and later Joseph Chapman as millers. After Joseph Peart died the ownership of the Mill is unclear although it is believed that the Gutch family owned it from at least 1877. Joseph Chapman continued to work the mill after Peart’s death. His children were the first and only children to have been born at the Mill during its entire history. After Joseph retired to Scarborough his son Charles took over but unfortunately he died young, in 1901, as a result of breathing in flour dust. Herbert Warters ran the mill from 1901 to 1922 and was followed by Thomas Mollett. The Mill ground corn until the early 1930’s using wind power and then continued with the aid of electric motors until production stopped entirely around 1933. The Gutch family sold the Mill to York Corporation in 1939. There were several attempts to restore the Mill and some work took place but it became neglected as the housing estate grew around it. David Lodge, a champion of Holgate, documented its history. We are eternally grateful for his drive and determination in raising awareness of the mill. In 2001 the Holgate Windmill Preservation Society was formed and through the dedication of its volunteers the Mill is now working once more.